the TraXtar™ Quad was originally designed to respond to market demand for increased door sizes and larger panel weights, enabling customers to expand their door systems for panel weights of up to 300kg. Launched in March 2018 it's 4 wheels increased load capacity and the roller was able to break through rolling resistance like no other product on the market. This meant that the end user would be able to operate a considerably large sliding door with minimal effort. 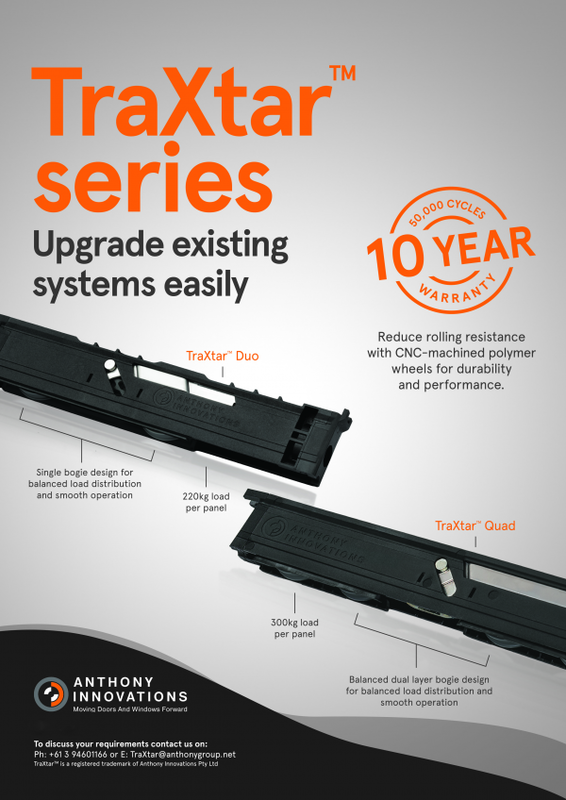 To continue building on this success and offer wider options to customers, Anthony Innovations recently expanded the series with the TraXtar™ Duo, a 2-wheel roller that provides the same unparalleled performance, specifically for panels of up to 220kg. Anthony Innovations brings over 65 years of experience in the development of new hardware solutions. We specialise in the design and manufacture of rollers that move large door and window panels for high-spec residential and commercial applications. We apply our industry expertise and the latest technologies, to develop new rollers that make doors and windows move effortlessly. Our engineers help door and window manufacturers globally to solve problems and in so doing, to stay ahead of their competitors. -Be modelled on TraXtar™ Quad. -Significantly reduce rolling resistance to enable easy movement of large panel weights. - Have a modular design so that it could be applied to most door systems and enable instantaneous upgrades for the customer. Excessive resistive force in the operation of windows and doors is a common complaint from the building and construction industry, which until now has been inadequately addressed. Whilst many companies have managed to address the load carrying capacity requirement, attention to rolling resistance has been secondary. We at Anthony Innovation, therefore, focused our attention on optimizing our design to incorporate features that provide an exponential improvement in rolling performance. As a result, testing data for TraXtar™ Duo shows that it has overtaken other 2-wheel rollers on the market, offering even smoother door operation. This is a notable development for the TraXtar™ Series, which has succeeded in providing customers with a high-performing 2-wheel roller that fits within the confines of existing rail profiles. Its high-quality components and outstanding design, reduce the effort required when opening or closing a sliding door. -Increasing the size of the wheel, to reduce rolling resistance as much as possible whilst still retaining its height for low site-line uses. -Seek to create maximum distance between the wheels to allow for load distribution whilst minimising flex in the components. -Create enough room for a mechanism that allows for easy adjustment under large loads. -TraXtar™ Duo is compatible with existing systems to allow old components, rather than an entire systems to be replaced. -The product is designed so that wheels are replaceable without having to discard the carriage assembly. Replacement wheel cartridges will be made available for sale. -Waste materials from moulding process are granulated and used in other non-load bearing or visual products. -Anthony Innovations uses state of the art FEA software to minimise the amount of material used to construct our components.